Looking back at how social media has crept into most people’s lives, I’m thankful for it in many ways, but I’ve also seen things that have turned my stomach. When I wrote my first book shortly after getting divorced, I knew I needed to find a way to promote it – and myself. To gain the confidence of my readers, I needed to show them that I was well versed in the subject I was writing about. How could I do that? I had many ideas, but I was uncomfortable with most options. I knew that my book would collect dust on bookshelves in many stores across the region if I didn’t promote myself. Since drawing attention to myself has never been my style, it was a trying experience. 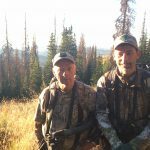 I created a website, which rapidly gained a lot of followers, and I began renting booth space at a few of the biggest outdoor/hunting shows in the region. I quickly gained the attention of many people, and my books began selling at a pace that far exceeded my expectations. I formed many great relationships and friendships, some people becoming very close friends. I’ll be forever thankful for that, but it brings me back to the attention thing. Every year, I enjoy seeing people display their photos across social media. It makes me feel good to know that they want to share their success with me and everyone else. We are a band of brothers – we are all hunters just like the generations that came before us. Then, I realize that it might sound foolish to a lot of people if they ever knew that’s how I think. I’ve gained a following due to my books and the variety of seminars I’ve done across the region. I’ve been lucky enough to speak at grade schools, high schools, outdoor shows, hunter education classes, and bible conferences. I’ve been invited to offer my “expertise” at these places because people respect what I’ve done. I’ve been lucky enough to have my work featured in North American Whitetail, and I’ve been honored to have been featured in Outdoor Life magazine and on Wired to Hunt podcast and Big Buck Registry podcast. In many ways, the outlets found me, I didn’t go searching for them. After being highlighted across the country for my success in the big woods and in the Midwest, I’ve attempted to help people hone their craft. I’ve received letters from people who have been able to find deer and kill them. I take great pride in the friendships I’ve formed through being available to the public, even though I still have a hard time having any attention focused on me. When I look in the mirror, I see an average hunter who has a well above average level of determination and confidence. Those are the reasons I’m able to come out on top during many hunts in new locations. I work harder than 98% of the guys who go into the woods every year, and hard work pays off. I’ll outwork you in every aspect of the game if it means I have a tiny chance to put a good buck on the ground. That work is never seen in a hero shot. I shared a picture of a buck on a deer cart this year. That is some of the work that my group faces after we are lucky enough to take a good buck. I know many others can relate, and that is why I shared that photo. I didn’t even mention which member in our group killed the deer. It’s not necessary to know. Instead, I wanted people to see some of the behind-the-scenes work that goes on. I hope I captured that with the photo. Recently, many people have asked me how my season has been. This season has been fantastic in many ways and horrible in others. If I based the season on big bucks being killed, it has been great. If I base it on life happenings during the season, it has been stressful, chaotic and heart wrenching. Over the last few years, I’ve chosen not to share too terribly much on social media or on my hunting journal on my website. People don’t realize how difficult it is to keep pace. I try to give people things to keep them interested with what I’m doing. I want people to read my writings, and I want them to buy my new book, however, I don’t feel obligated to post the hero shots. I don’t need to draw any attention to myself. If you ask me at a show, I’ll gladly share a few photos with you. Those photos are my memories. It’s easier for me to let history speak for itself. When writing, there’s a fine line between giving too much or not enough information. It’s important to walk lightly across the thin ice, because too much weight will cause the ice to give way below you. When I left the Adirondacks to try my hand in the Midwest, I felt like I had nothing left to prove to the ones who scoffed at the idea of me leaving the hallowed ground, the mountains of upstate New York. I now feel the same about social media. I don’t feel a need to share photos of successful hunts. I’d rather share my knowledge if it can be useful to a young hunter. Instead of getting a couple hundred likes for a giant buck I killed, I’d rather get the couple hundred likes because I shared my buddy TJ and his son’s hunt. It’s our job to keep the tradition alive and well rather than pad our own egos. Since I’ve never had a big ego, this doesn’t seem too difficult for me. I hope many of you understand my reasoning and remember that writers only write what they want you to read. Most good writers have a way of bringing their readers into their world but not their intimate world, where only few others have been allowed to sit down and know what goes on behind the scenes. I’d like to give everyone a simple thank you for following me. I’ll still share some pictures along the way, but I will try to avoid the immediate picture posting to draw attention. It’s just not my style, and I believe we should all stick to what works for us, which is different for every person. A lot of this probably sounds hypocritical, but it seems to work for me right now. I have a lot going on in the coming months with the new book coming out and a few seminars scheduled. I hope to see many of you on my journey. Thanks for listening to me babble. Shoot straight and hunt harder than the next guy. Never feel that you need to share your success with anyone to justify your time in the woods. I’ve seen many great hunters go home with unfilled tags on many occasions. Having an unfilled tag doesn’t mean that the person didn’t have plenty of opportunities to take a good buck. It just means that he didn’t feel it necessary to justify his place in the hunting world. He’s at peace with himself and his actions. He has proven time and time again that he can get it done, almost at will, anytime he so chooses. If you see me at one of the shows this winter, please stop by and share your stories with me. I’ll gladly share a few with you, too. I apologize if people follow me solely for the hero shot pictures. I’ve come to understand that there’s so much more to my place in the outdoor world than that. I just hope I’m doing a good job filling the void for other people like me. This entry was posted on Tuesday, December 4th, 2018 at 5:22 pm and is filed under Uncategorized. You can follow any responses to this entry through the RSS 2.0 feed. You can leave a response, or trackback from your own site. Scott, thanks for your feedback. You got it right. When we shoot deer, it’s everyone’s deer, no matter who killed it. We all put so much work into it that we are all happy and feel a sense of accomplishment if anyone gets one.